What a pretty little book. I can't believe how much wisdom is crammed between these covers! Oh, Brenda! I am so proud of you for getting this project done so quickly and so well. If you want to get a copy, take advantage of our Special Offer by clicking here. If you want to write a review, we urge you to do so ... and thank you in advance. 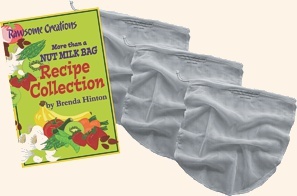 More than a Nut Milk Bag Recipe Collection is an AWESOME book. You find everything in there and more! Even the seasoned rawfoodist will be surprised to learn something new! For my part, I've discovered you can dehydrate spinach & make powder you can use to season your salads! And the recipes?? Let me name you some that are to DIE FOR: Almond Cream, Cashew-Brazilian-Hempseed Milk, Bloomed Quinoa, Energy Bars, Lemon Bars, and SO MUCH MORE! Mium! And I have ONE word to describe the Rawsome Creations Template Wrap's creator: GENIUS!! At last, an inventor in the raw food world that has put herself in OUR shoes. This recipe book has so much helpful info, as well as delicious and healthy recipes. My favorite is the corn chowder! This book will open your eyes to completely new ways to eat food you already love! This book is absolutely outstanding! For someone somewhat new to raw foods, I found this book, and the More Than A Nut Milk Bag to be my new favorite! The recipes were very easy to follow, the book is loaded with great resources and recipes! Finally a recipe book that makes sense! I highly recommend this to anyone and it makes a great gift!! This recipe book is written very passionately by the author. It is a perfect starter book into the world of preparing raw foods. Chef Brenda Hinton explains clearly the tools you will need and starts you out with basic easy recipes so you can learn how to introduce raw food meals into your diet. Lots and lots of helpful tips. Easy to read. Love the fact that some of the proceeds of the sale of this book and her nut milk bags goes to charitable organizations. Thank you for sharing you knowledge with such enthusiasm! If you already have a copy, look on page 102 for your free username and password, then click here to log in to the reader's pages. For international orders please email Brenda for a quote. Remember to include your order and your address!